I’ve had a few tough moments in my life, but I am hoping my luck has turned and that I will find a loving home where I can get better and heal. Even though I have had some hard times, somehow I have managed to keep myself upbeat and full of love, and this is what has helped save me. And since I am GREAT with kids– as you can see in the picture– and good with other dogs– I hope this will help me find my forever family. You may be wondering what makes me a “special needs” pup… Well hopefully this will be temporary. I arrived to Animal Control with a very visible leg deformity, and so I wasn’t really high on their ” fit to be adopted out” list, and then when the shelter became full, I almost ran out of time. Lucky for me, volunteers noticed me and my sparkling personality and campaigned hard to save my life… I almost became a Facebook celebrity, if I may say because they felt so strongly that I deserved a chance. And thanks to all their hard work and all the wonderful people, I am here today!! 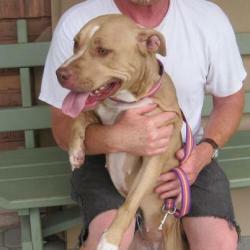 A little more about me: I’m about 2 1/2 year old girl, who is great with children of all ages and good with other dogs. I love attention to myself though, so may do better as an only dog in a home setting. I’m told, I’m sweet as pie and hope that you will consider welcoming me in your family, help me get my surgery so I can be a normal pup! All rescued dogs are vet checked, microchipped, vaccinated and spayed or neutered. All adoptions are refundable for up to 60 days. Adoption fees range from $100 to $400 depending upon the age and breed of the pet.